Model prediction A lot of research from buoys and other in-situ sampling had already indicated that water in this region of the Arctic had been freshening. Winds and currents have transported this fresh water around the ocean until it has been pulled into the gyre. The volume currently held in the circulation probably represents about 10% of all the fresh water in the Arctic. If the fresh water were to enter the North Atlantic in large volumes, the concern would be that it might disturb the currents that have such a great influence on European weather patterns. 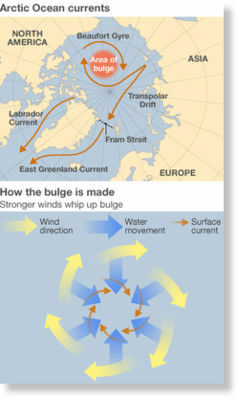 These currents draw warm waters up from the tropics, maintaining milder temperatures in winter than would ordinarily be expected at northern European latitudes. "So, as the wind acts on the ice, it's able to pull the water around with it. Depending on how ridged the surface of ice is or how smooth the bottom of the ice is - this will all affect the drag on the water. If you have more leads, this also might provide more vertical ice surfaces for the wind to blow against."